The mobility landscape is a constantly evolving business sphere. Given its ever-changing nature, enterprises must constantly be prepared to adapt to new mobile technologies and trends in order to effectively operate with the times. Thus, “enterprise mobility”, as a strategic business concept, is quite fluid. Clutch partnered with DMI, a leading end-to-end mobility services company , to produce a survey of 582 enterprises (defined as companies with 500+ employees) in efforts to understand how exactly enterprises define and approach this crucial business pursuit. Specifically, this survey sought to identify trends, and the future direction enterprises plan to take, regarding their approach to mobile strategy and investment. Cloud integration is the top mobility priority among enterprises, both in terms of current efforts and future plans. Managed services—mobile device management, mobile application management, and mobility managed services—all rank within the four most common mobility efforts pursued by enterprises. Enterprises struggle to find a balance between access and security regarding their data. 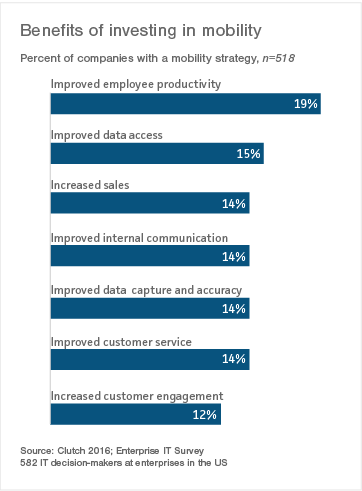 “Improved data access” ranked among the biggest benefits, while "data security" was identified as the leading challenge, of mobility investments. Mobility, as a strategic business pursuit, is nearly unanimous in the enterprise; currently, 89% percent of enterprises have a mobility strategy in place. 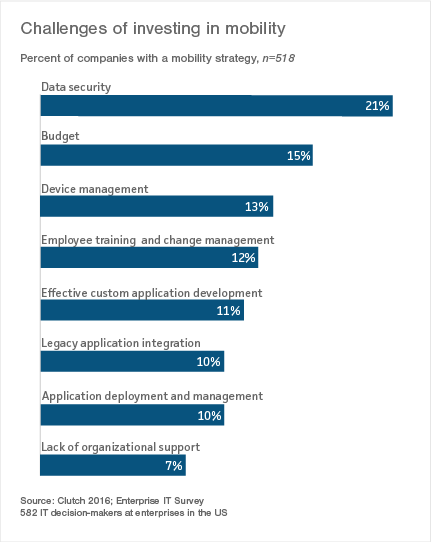 An enterprise mobility strategy, though, has no one standard definition. Richard Rabins, CEO of Alpha Software, describes a mobility strategy as primarily concerned with “defining the areas where mobile can impact [enterprises] the most, by either getting information faster and then acting on that information”. 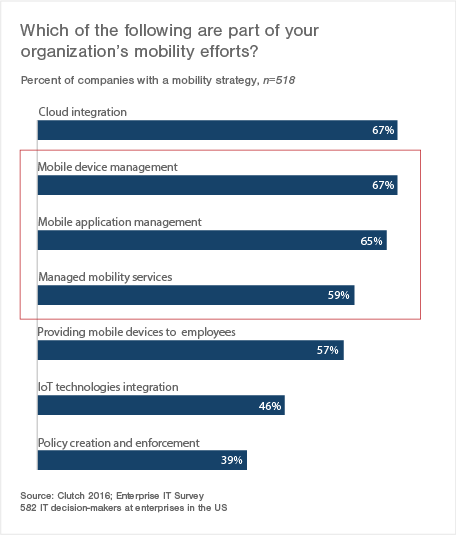 In the survey, we followed Rabins’ impact-centric model by defining “mobility strategy” according to the scope of mobility efforts pursued by enterprises. Mobilizing company data, via transitioning to and leveraging cloud services, and the security quandary that process creates. Formerly concerned primarily with expanding mobile communication capabilities, mostly through the provision of mobile devices to employees and access to email and corporate channels, the major focus in enterprise mobility has recently shifted toward the larger strategic objective of mobilizing company data. As Dogra explains, the primary vehicle by which this large-scale data mobilization effort is accomplished is through using cloud solutions. Ultimately, through facilitating scalable data management and expanding employee access to company data, all the while enhancing mobile security, the cloud provides enterprises with an advanced degree of flexibility in handling company data, thus allowing it to be used as a ubiquitous business resource. However, more fluid data mobilization, as facilitated by the cloud, presents an added dimension to the existing enterprise mobility security complex. “Now that mobile devices are being used for more than just email, it’s not just about securing the device. With increased access to corporate data, organizations are moving from securing the device to securing the data.”-Kathleen Urbine, Executive Vice President for Mobility Managed Services, DMI. Specifically, mobility-related business investments have a compounding effect on security concerns due to the increased number of end points-i.e smartphones, tablets, and sensors- that all have access to company data and networks. As Urbine describes, enterprises must now secure the physical device, the data it can access, as well as its points of access. Ultimately, this process and added premium on data security fuels a sort of “access vs. security” dynamic in the enterprise, in which enhanced mobile access provided by investment in the cloud becomes pitted against the security threat it poses. This quandary is apparent when measuring the benefits against the challenges of investing in mobility: “improved data access” is listed as a top benefit of investing in mobility, while “data security” is pegged as the biggest challenge (ahead of budget). Sinchak’s nuance underscores the new reality regarding enterprise data security in an increasingly mobile economy, in which data security will always be a challenge. Given this situation, the best an enterprise can do is find a happy medium, or appropriate level of authentication in any given situation, that effectively minimizes security risk. 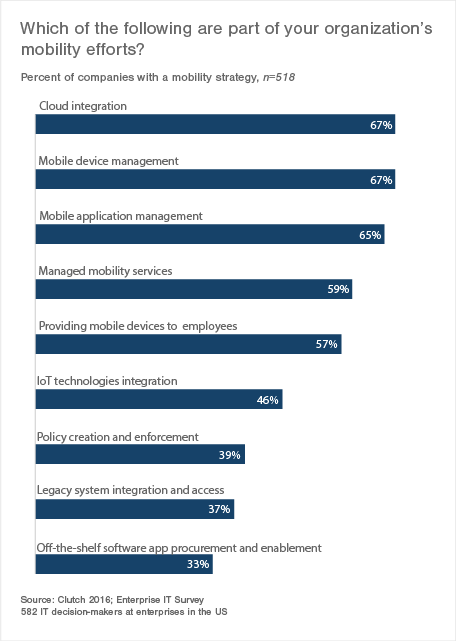 While cloud integration tops the list as the most common current mobility effort in the enterprise, three of the four most common efforts regard the management of existing mobility pursuits and investments, namely mobile apps and devices. Nearly two-thirds of enterprises invest in mobility solutions such as mobile device management, mobile application management, or leverage managed mobility services, in order to deliver their mobility solutions. As Urbine surmises, managed services use a shared cost model to reduce cost, allowing enterprises to redirect their mobility budget dollars toward other investment priorities while still harvesting the benefits of previous mobility investments, like mobile apps and devices. Our research shows that 69% of enterprises expect investment in mobility to increase in 2017. 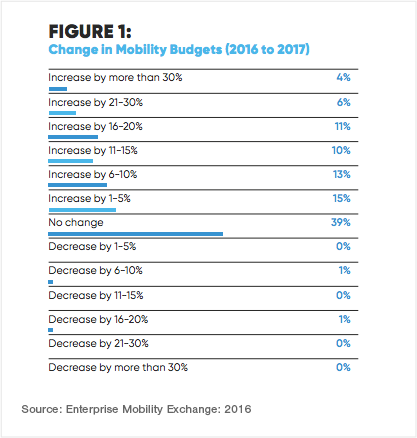 A recent report done by Enterprise Mobility Exchange on the outlook of mobility in 2017 reinforces this finding, and indicates that well over half of organizations expect their mobility budgets to increase. 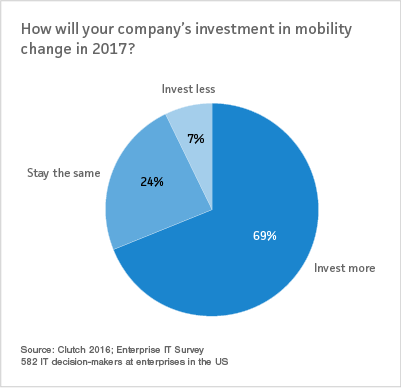 Both reports also find that less than 8% of organizations will decrease their investment in mobility over the next year. Specifically, the expected primary mobility areas of impact in 2017—cloud integration and security—are extensions of the mobility priorities of 2016. 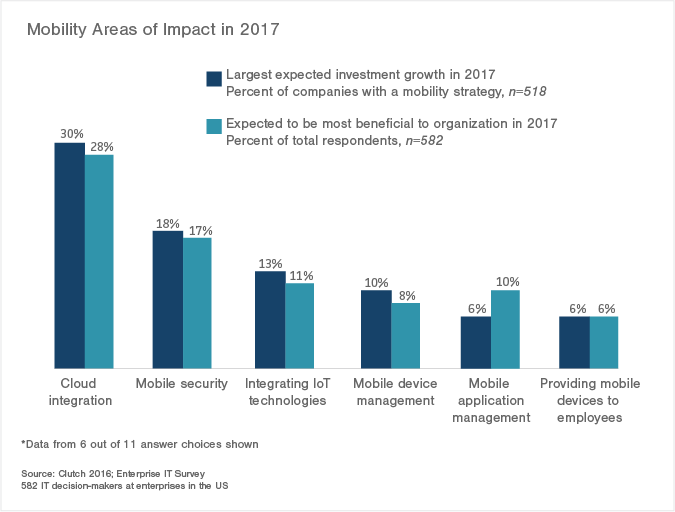 Cloud integration and mobile security are expected to bring benefit (28%, 17% respectively) as well as experience investment growth (30%, 18% respectively) by more enterprises than any areas in mobility this year. With the increased focus on newer focus-centers in enterprise mobility, enterprises will continue the trend away from traditional mobility pursuits, like providing mobile devices to employees and mobile application management (6% each). In addition, the increased investment among enterprises in these specific mobility efforts over the next year will likely further fuel the “access/security” dynamic as a challenge for enterprises. Thus, going forward, enterprises will continue to grapple with the reality of ever-increasing mobile security exposure. That being said, they will also continue to streamline and scale data accessibility and security using cloud, facilitating more efficient more efficient business and operations. 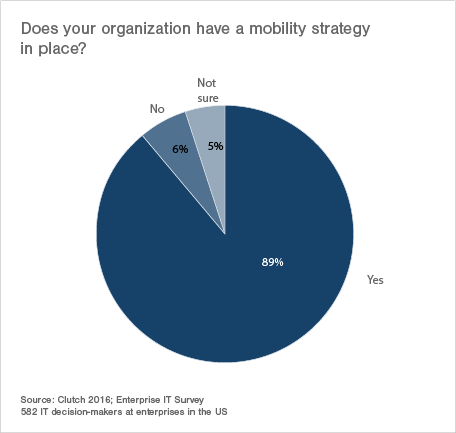 Clutch partnered with DMI to survey 582 US-based enterprises regarding how enterprises approach mobility strategy. Clutch defines an enterprise as an organization with over 500 employees. 68% of enterprises surveyed have at least 1,000 employees. 70% of respondents hold the position of senior manager or above. The results of this survey were collected throughout October and November of 2016.